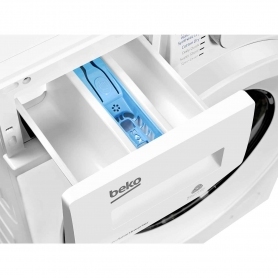 Cut your dirty washing pile down to size with the Beko WDC7523002W. 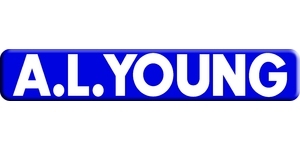 Numerous time saving programmes and features help get your laundry clean and dry in record time. 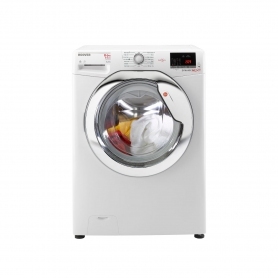 Turn your laundry day into hours thanks to this model’s generous 7 kg washing and 5 kg drying capacities. 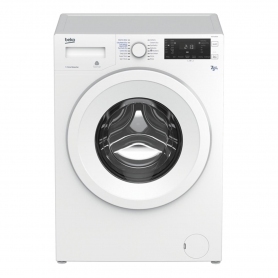 Able to wash around 35 t-shirts in a single load, the WDC7523002W is ideal for families and busy households. The large front porthole and wide opening angle make loading and emptying the machine hassle free, and the liquid detergent compartment ensures great distribution during the wash cycle. It's not only the large capacity that makes the WDC7523002W ideal for families. The child lock function stops little hands from adjusting the programme settings - simply press and hold the relevant buttons for three seconds and the LED display will indicate that the child lock has been enabled. 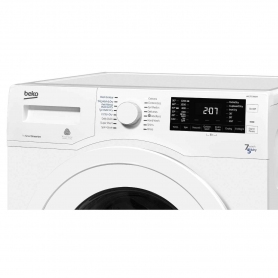 This Beko washer dryer has a number of programmes and features to reduce the amount of time you spend doing laundry – allowing you to get on with your day. In addition to programmes that decrease washing times, there is also a Quicker Wash function. This can be used on Cotton or Synthetics programmes to decrease the washing time for the selected cycle. 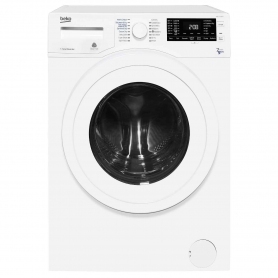 The WDC7523002W comes with all the programmes you’d expect from a top quality washer dryer and also features some specialist cycles that take extra care of your clothes. The Hand Wash programme uses a gentle washing action – perfect for that luxury cashmere jumper – and the Woollens cycle has been awarded a Woolmark certification for its exceptional cleaning and care. Endorsed by Allergy UK, the anti-allergy wash and dry cycle is ideal for households with allergy or asthma sufferers. By automatically selecting the optimum water temperature and increasing the amount of water used during the cycle, the anti-allergy programme helps reduce the amount of allergens present after the cycle has finished. 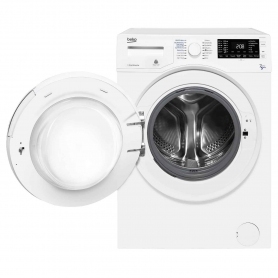 With five drying programmes and both sensor and timed drying options, the WDC7523002W will have your clothes clean and dry in no time. Sensor drying measures the moisture left in the drum and stops when the clothes have reached the desired level of dryness. Timed based drying allows you to select a drying cycle lasting 30, 90 or 150 minutes. 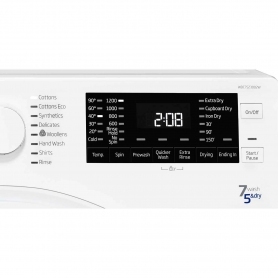 Pressing the Drying button on the LED display to select either a sensor or timed drying option to start automatically when your selected washing cycle has finished. With 16 programmes and numerous drying options, this Beko washer dryer makes light work of your dirty laundry. Order yours today.